If life leaves you pizza dough, make more pizza!! I love mini sizes portions, and bites, I think there is some cuteness in the size of a small bite, you don’t have to cut it, destroy it in from of your eyes before it reaches your mouth. It fits there perfectly. As far as pizza and coffee are concerned, I tend to be a real snob and compare all pizza to pizza in Italy, after all they invented it, so throughout the centuries, they have mastered the art of pizza making. There are a few good pizzeria in San Francisco where the pizza is close to Italian pizza (France has awful pizza, I remember a pizzeria in Nancy where I grew up called La Mamma, where they served pizza with gruyère cheese, that was terrible). I have no idea if the greatness of Italian pizza has to do with the brick oven where it’s cooked, with the natural flavor of the ingredients that is different, but it’s something hard to describe, the dough is thin and crunchy, there is little cheese and the cheese melts to perfection and does not hardens that quickly. I am not going to discuss the perfect dough texture, or flavor, nor give the description of the perfect thread of melting mozzarella, (maybe if I was Balzac I could)! because I don’t think I have enough English vocabulary but it’s something you have to experience for yourself. I was thinking to build a brick oven in the garden mainly to cook pizza, but unfortunately the size of the garden will not allow it. I think we all have our particularities in the way we approach certain traditions and traditional dishes. We all have our favorite pizza, it can be deep dish, thin crust, with one or two toppings, etc…and that’s the way it should be. Eat pizza the way we like it. These mini pizza are not what you would find in a traditional pizzeria in Italy even though last time I was there, I was invited by the family to try a pizzeria that had dessert pizza on their menu, such as orange pizza, chocolate and nut pizza, etc…and were surprisingly enough, really delicious. These mini pizza combine the flavors of Mediterranean countries, and are delightful. The beauty of small bites is that you eat one or two and you feel satisfied, when you have a whole pizza in front of you, you feel somehow “obliged” to finish it (I do). Place flour in a working surface, gradually add yeast/water mixture, salt and oil. Mix well to obtain a soft dough, the dough should be elastic and souple, almost sticky. Cover with a towel and let it rise for about 2 hours. Grill the eggplant slices on a grill pan. Cut in halves and set aside. Trim the artichokes, removing the green leaves around, cut the top and cut in quarters. Place in a lemon juice/water bath to prevent them from staining. Saute in olive oil and garlic until tender. Adjust with salt and pepper. Cut dough in four equal parts. Roll each dough portion with a rolling pin (or with your hands if you have mastered the art of twisting the dough). Spread some red pepper pesto on top of the dough, add eggplant, artichokes and feta, if you using olives add at this point.Adjust with salt and pepper if necessary but the feta and olives being already salty, you might decide not too. Cook in a 390 F pre heated oven for about 20 minutes or until the bottom is cooked. This entry was posted by silvia on April 25, 2010 at 10:32 pm, and is filed under tarts and pizza, Vegetarian - dairy. Follow any responses to this post through RSS 2.0.You can leave a response or trackback from your own site. I think they’re really cute and presentable! You’re right about it. Sometimes, just wasn’t feeling right with all those fillings dropping all over your plate. But with that size, you can even serve individual flavour according to their like & dislike! Nice huh! These mini pizzas are the prettiest things I think I’ve ever seen. You’re so right – their beauty doesn’t get destroyed before you put them in your mouth. I wish you could email me one (or two). I am a pizza snob too (and a coffee snob, wine snob, and bread snob!!!). Oh my, that is a pizza I would looove to dig into! Pizza looks fabulous! All of my favorite ingredients!! Love your recipes and pics! This looks really really good! Great idea for my vegetarian day. THAT IS GORGEOUS. Oh my goodness! I love the individual mini pizzas, and the combination of toppings is terrific here! Looks so delish! Mouthwatering photos! Beautiful pizzas. I think making your own dough makes all the difference. Kind of like making your own pasta. Wonderful job with the Mediterranean flavors. Well done! Cheers! Wow Great pics and I am cooking this tonight. Thank You! Wow… Pizza looks fabulous! very savory… and beautiful photo. What a beautiful presentation of the pizzas!!! I love your toppings too, very Mediterranean, I absolutely love love love grilled eggplant. OH yes and it’s vegetarian, who says pizza can’t be healthy?? Love this! I love these! (I understand what you mean, I am a bit of a pizza snob in a different way – New York pizza. When done right, it is it’s own perfect thing. Something to do with the water!)) These are perfect little homemade pizzas, I can tell just to look at them that I would love them. The flavors are great and the dough looks perfect. Too bad you didn’t join the pizza party the other week!! Beautiful Pizzas! 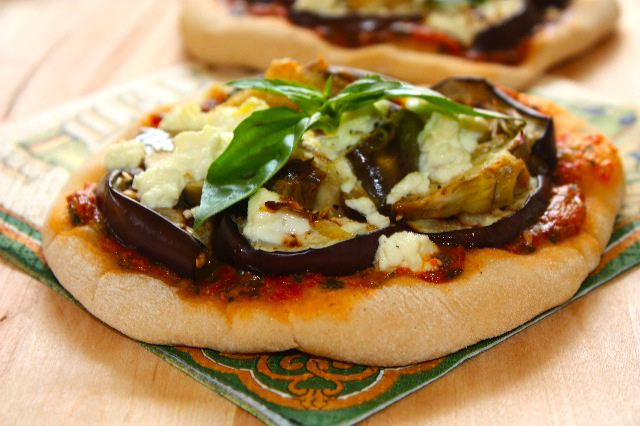 I don’t think I’ve ever had eggplant on pizza..,Can’t wait to try it! 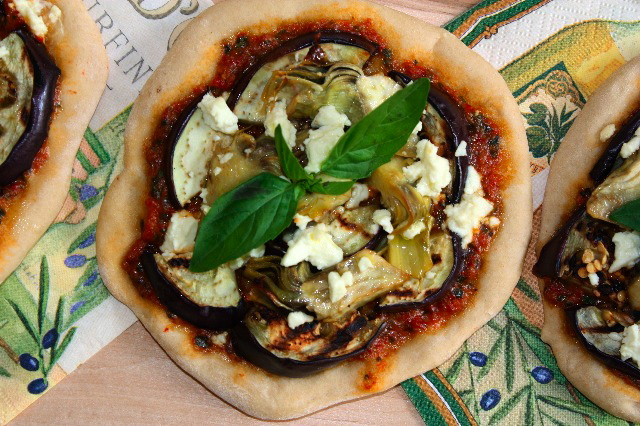 Thanks for this recipe, I am in possession of one medium size eggplant and this pizza may well be in my future! Pizza – “friendly” – I don’t even need a slicer. Just pick one and eat! Yum yum. Looks tasty, I love the addition of artichokes. You have to love a meal that combines so many vegetables in one bite! I LOVE pizza and this looks absolutely divine! I am really enjoying your blog….so many different flavors here. Thanks so much. cheers. Every ingredient for the topping screams delicious. Had me at feta. Then saw the kalamata, artichokes, basil, olive oil, eggplant. How can it not be delicious? This pizza has all of my favorites.